The U.S. Geological Survey will be adding mountain bike trails to future topo maps. The first of the new maps will cover Arizona, followed by a group of states that include Nevada and California. 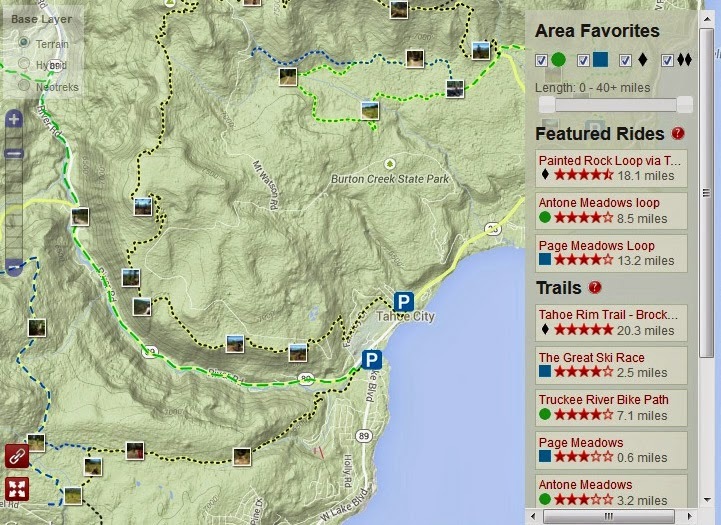 Tahoe City trails in MTB database. The trail data is being collected by the International Mountain Biking Association (IMBA) through a partnership with MTB Project. Trail riders submit their GPS ride data to MTB Project for review, completeness and accuracy. The ride data will be passed on to the USGS. This partnership between the public and private sectors, and crowdsourcing, is a new way to get high quality trail data on the USGS National Map and US Topo quadrangles. You can become part of this crowdsourcing project by submitting your rides to MTB Project. The more ride data submitted helps to improve accuracy and completeness. Only legal trails will be placed in the database. Free Android, iPhone, and iPad applications are available from the MTB Project website for access to all the ride data that has been collected. Search for rides in your area and discover new trails.